I’m not a fan of fan games or reusing other peoples sprites or other art assets like this (especially from mainstream commercial games) but I’m also an inconsistent hypocrite. So this is what I did yesterday (and finished up today). 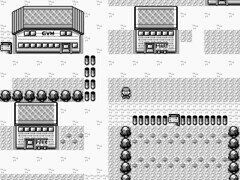 I went and found a complete map of the over world from the original Red/Blue Pokemon games, made a sprite sheet consisting of (nearly) all of the tiles used in it, wrote a simple program (using C++ and SDL) that matched each 16×16 section of the map to one of the tiles and saved the map as a nice small usable 2D char array of tiles, got confused when it didn’t work properly, re saved the map and the sprite sheet images with the same limited color table (why were the RGB values differing ever so slightly from pixel to pixel like someone had thrown a random number generator at them!? It was in PNG format when I got it so it wasn’t like it had been ruined by compression artifacts. ), re ran my program, manually filled in the remaining missing tiles (NPCs, why you gotta block the view of the world I’m re creating? ), then I went and got the sprites for the player character and fixed it up for my game, added player movement and animation in a way that kept the player on the same grid as the tiles that the world is constructed out of, assigned a solid or not solid value to each tile, prevented the player from walking onto solid tiles, made south facing slopes push the player down, re wrote the games rendering to use hardware accelerated polygons with OpenGL or RSX instead of just blitting the images with SDL surfaces because that’s preferable for PS3, compiled a PS3 version, then I posted about it online and then after waiting you you to finish reading what I had posted I told you to “Just go download it already if you find it so fascinating”. Just go download it already if you find it so fascinating. The “game” spawns you in Pewter City. You can walk around and that is really all you can do. You can’t enter caves or buildings. Use the directional pad to walk and hold the X button to disable collision detection. I have a few conflicting ideas for what I should do with this next. I’ve more or less decided against doing what I had originally planned to do… But in any case I am going to being working on this a bit more and there is definitely going to be a Windows and Wii version of the next release and possibly even a GP2X port. It is highly probable that this may end up featuring the Pokemon card game instead of actual Pokemon training and combat. Or it might just be a lolwut horror game. Or a shooter. Something about the grayscale graphics makes me want to put red blood in it or do something with color. Or this could just end up being a verbatim remake of the original game.